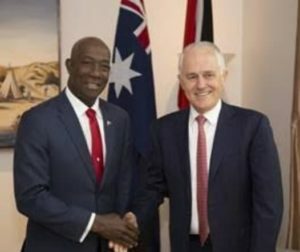 Prime Minister of Trinidad and Tobago Dr the Honourable Keith Rowley continued his working visit to Australia today (Thursday 24th May, 2018) accompanied by Minister of Foreign and CARICOM Affairs, Senator the Honourable Dennis Moses and Minister in the Office of the Prime Minister and Minister in the Ministry of the Attorney General the Honourable Stuart Young. Matters of national security, border protection, counter terrorism as well as sea transport were the main focus for the team in Australia. 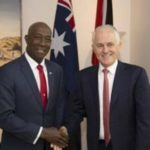 Prime Minister Rowley met with the Prime Minister of Australia the Honourable Malcolm Turnbull at Parliament House. The two Prime Ministers were later joined by Australia’s Minister of Foreign Affairs, the Hon. Julie Bishop, Australia’s Minister of Trade, the Hon. Steve Ciobo as well as Ministers Moses and Young. Earlier in the day Prime Minister Rowley and his team also attended a meeting with the Commonwealth Counter-Terrorism Coordinator Mr Tony Sheehan.